Day Ten: We started our day with meditation at Purer Temple at 6 am. The significance of this temple is its connection to Swami Satchidananda. This was his temple. On the way there Swami Divyananda shares a little about the temple, emphasizing that it is small and not nearly as grand as some of the others we’ve visited. She has a way of lowering our expectations and so once again we are pleasantly surprised. It’s beautiful. As we enter the sanctuary with dancing Shiva or Nataraj at its center, my eyes are drawn to the high ceilings artfully painted with depictions of scenes from various religious texts. The statues of deities are so precious they reside in protective cages. The columns and floor are made of the same stone we have been experiencing at other temples. We sit here in meditation for about 20 minutes. Unable to still my toddler-like mind I occasionally peek at Swamaji hopeful she will be stirring and ready to get up. At one such moment I catch her looking down at her clock. Now? She places the clock back in front of her and closes her eyes. Deflated, I do the same. 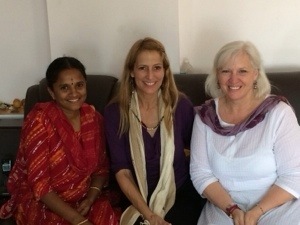 A few minutes later we are up and headed to another sanctuary for puja. As part of our visit here today we are going to watch Kaylani, the beloved temple elephant get her morning bath. I think I hear her as we make our way from place to place. I don’t want to miss it. I want to make sure we’re not going to miss it. I would be very disappointed if we missed it. Very distracted today. We are at our destination, another cave-like sanctum with no ventilation. I’m getting used to the closeness. For the first 20 minutes I am uncomfortably seated as the priests prepare. The holy men performing the ceremonies are decorated wish ash and red paste on their brow. They are wrapped in several cloths; the dhoti or skirt type cloth that is worn around the waist like a towel and one other cloth tied around the belly like a sash. The dhotis of the priests are often pulled up from back to front and tucked at the navel similar to what a sumo wrestler may wear. The first one we encounter is quite jovial and smiles at our western ignorance, trying to help us line up properly. We are not alone, although as special guests we are welcomed into this sanctum first. Several Indians begin to come in and line the walls standing. I take my cue from them and stretch my crumpled knees. It’s warmer standing, which I didn’t think was possible, but I appreciate being vertical all the same. As the priests wash the lingam with many liquids, two lines begin to form behind us just outside the threshold of this special room. Slowly offerings are passed into the room and placed on the low stainless steel table occupying the center of the space between the two rows of our seated group. More people join us filling the space with body heat, devotional energy and the scent of flowers as they place their offerings of garlands and rice with the others. It’s crowded. I am standing near the door out and several times the woman on the other side of the door brushes my pant leg with her outstretched hand indicating I should back up. There’s no room. Here’s the interesting thing about Indians and space. Where I see a crush of people with barely space to slip a piece of paper between them, the priests somehow find space to navigate from back to front with a giant vat of what appears to be milk. So it’s up to me to find the few centimeters that are surely there to back away from the door. As I stand sweltering, shifting from foot to foot, careful to stay well within the doorway, I begin to glance around the room taking in each person. What brings them here? From where does their devotion come? Is it choice, habit, guilt, gratitude? My sense is it is a combination of choice and gratitude and an undeniable love. There is a humility we don’t often see in the states. They are truly devoted to god and openly worship and KNOW it is god’s plan they are living. We’re so egocentric – as a whole – it’s hard to let go of the idea that we are in control. Yet we are shown the truth of it every single day. With all this devotion and history, the trappings of a modern world make themselves known. Two men in their 30s are checking stocks on their phones, outside the inner sanctum two different ring tones are heard. This makes no difference to the priests performing the ritual bathing of the lingam. This puja is involved. The lingam is washed with many liquids symbolizing things I cannot begin to imagine. At one point a reddish paste is placed on the statue to hold coins received from devotees. The priest pauses so everyone can view the magic. Then that’s washed off. More fluids are poured then finally a cleansing bath of water. A curtain is drawn as the offerings disappear from the table. The big reveal is coming. Just a few moments pass and the curtain is swept back with great flourish. The Indians make a series of complicated hand gestures; touching their faces and chests one after the other. It’s as if this is the first time they have seen this. There is an element of awe. The lingam is decorated with all the offerings, covered in flower garlands from top to bottom. It’s over. Some begin to leave. We are to stay. We are once again asked our names and blessed. Our foreheads receive ash and garlands are hung around our necks. Now we are free to go. As we exit this sanctuary into the fresh air outside we find ourselves in front of Kaylani. I had almost forgotten her in all the activity of the inner sanctum. She has finished her bath and is now being lovingly decorated by her mahout. Drawings in white adorn her forehead, the top of her trunk, parts of her ears and around her tail. When complete, under supervision, she begins to run toward the altar of Shiva to pay her respects. Swamiji tosses her bag and scarf at one of us and takes off after her. Others follow. It’s so joyful and such a contrast to puja. But it’s all celebration. Now, it is time for breakfast. What a morning. We have a few hours to ourselves before we are to have lunch with a local Integral yoga family. We are going two by two. Karin and I are going together. I’m always a little uncomfortable at first in these potentially awkward social situations. A part if me wants to avoid it, but my curiosity, which nearly always wins, will do so again today. We are to be picked up by our host at 12:45. We wait. Just after 1:15 he arrives, with a warm smile and apologies for his tardiness. Swamiji has been waiting with us and decides to come along for the first few moments. This helps create a nice smooth entry. It was lovely to have Swamiji with us but proved to be totally unnecessary. What a beautiful couple. As is the tradition before a meal, we chatted with each other revealing what we thought was important for the other to know and asking appropriate questions. The husband is an engineer with a masters degree, his brother, a doctorate in engineering. Neither of their parents went beyond the third grade. Their own daughter is studying for college boards in hopes of becoming a doctor. We talked yoga, family, politics and Tamil life. They answered every question we had. We were served a traditional Tamil banana leaf lunch. But this one tasted special. Worried we may use our left hand or mix things wrong we were assured we were guests and could do no wrong. There were just two large banana leaves on the table. We ask if they’re joining us? We are not excited about being watched while we eat. Half of another banana leaf is placed on the table and our host sits before it. Meanwhile we are to start eating, as our hostess begins placing food on his leaf. She will not eat with us. It seems that traditionally the wife does not eat with everyone when there is company. She remains available to serve. Everything about this wonderful couple is about service. There is a lovely puja room, most people we have met here have puja rooms or dedicated shelves. They were actually supposed to join us on half of this trip but decided to stay home so they could go to temple daily to pray in support of their daughter’s upcoming exams. This is the kind of people they are. At one point during lunch I was trying to remember the name of the rice dish I had for breakfast. I knew it started with a “p” but could not put the rest of it together. Finally Deebha said, “Pongal?” To which I excitedly said, “Yes!” She high-fived me. As our time together came to a close we asked for photos with them. They happily obliged, rotating through everyone’s cellphones and even setting the timer on their own camera. Midway during the photo session they had a quiet little side conversation and Deebha disappeared. A moment later she emerged from a room with red paste for our brows and a scarf for each of us. It was the sweetest gesture made all the more special because I don’t think they were planning on doing it. Teary eyed we hugged our hostess, said our good byes and thank yous and follow our host down the steps to retrieve our shoes. As we were leaving, grandpa showed up on a scooter with their niece. All smiles and warm greetings, this is one lovely family. Back at our hotel we drop our things and set out to explore Coimbatore on foot. This town’s streets are much cleaner than we have seen in other areas of India. The sidewalks however leave much to be desired. There are unmarked and uncovered holes in the concrete, scaffolding that juts out randomly, sawed off metal posts, rusted by rain and weather. A potential danger with nearly every step. It’s actually safer to walk in the streets. And so we do after Karin trips over a scaffold support made of metal, slamming both of her shins and diving forward, gracefully catching herself before face planting, but not without a few choice words on her way. We soldier on, there are sites to see. In this town there are lovely trees lining the city streets providing a canopy of shade and an air of sophistication. At a slightly higher elevation, the climate is temperate here. We’re not suffering the heat like we were on the coast nor are we cold in the evening as we suspect we’ll be up north. It’s pretty perfect. We wandered back to the hotel in time for our evening yoga class at the Integral Yoga Institute of India. It’s a very modern building from the outiside with marble floors and majestic wood doors inside. We’re warmly welcomed then left on our own to do yoga, one of our group leading us, but afterward our hosts offer us prassad and smiles as they bid us farewell. A long day rich with blessings and meaning. So spiritually fed, there is no need for dinner. I head off to bed relaxed and with a full heart.